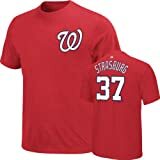 Stephen James Strasburg, born July 20, 1988 is an American baseball pitcher for the Washington Nationals of Major League Baseball (MLB). A talented but unpolished high school baseball player at West Hills High School, Strasburg played college baseball for the San Diego State Aztecs. There, he became one of the best collegiate pitchers in the country. He pitched for the United States national baseball team at the 2008 Summer Olympics, winning the bronze medal. Two years later, Strasburg was called the "most-hyped pick in draft history" by ESPN and the "most hyped and closely watched pitching prospect in the history of baseball" by Sports Illustrated. 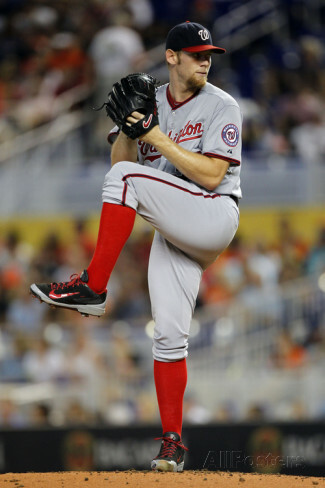 Strasburg's major league debut on June 8, 2010, produced a franchise-record 14 strikeouts. 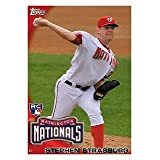 When the Washington Nationals' Stephen Strasburg made his debut as a MLB baseball player on June 8, 2010, against the Pirates, a Sports Illustrated columnist termed it "the most hyped pitching debut the game has ever seen." Truth is Strasburg had been attracting a lot of attention for several years and deservedly so. Pitching for the San Diego State Aztecs in 2008 and 2009, he set the Mountain West Conference on fire. In 2008, the pitcher tallied 134 strikeouts in 98 1/3 innings, finishing with an 8-3 record and a 1.58 ERA. He finished the 2009 season with a 13-1 record, struck out 195 batters in 109 innings, and lowered his ERA to 1.32. He pitched a no-hitter in his final home start, stiking out 17 batters. He was chosen by the Washington Nationals with the first pick of the 2009 draft. He signed a record $15.1 contract on August 17th, just 77 seconds before the signing deadline. Strasburg made his professional debut on October 16, 2009, pitching for the Phoenix Desert Dogs in the Arizona Fall League. By May of 2010, he had been promoted to the Triple-A Syracuse Chiefs. By June, he was called up to the big club. Several months into his major league career, Strasburg tore a ligament in his pitching elbow. The injury required Tommy John surgery and a year of rehabilitation. He rejoined the Nationals on September 6, 2011, but was only able to pitch 24 innings that year. His 2012 season marked a successful return to form. In April 2012, Strasburg accumulated an NL-best 34 strikeouts and second-best 1.13 ERA. He totaled 6 walks and did not give up a home run. Consequently, he was named NL Pitcher of the Month. On May 20, Strasburg went 2-for-2 as a hitter in a game against the Baltimore Orioles and hit his first career home run, a solo shot off of Wei-Yin Chen. In his June 13 start against the Toronto Blue Jays, Strasburg became the first pitcher of the year to strike out 100 batters. On July 1, Strasburg was elected to his first All-Star Game, alongside teammates Gio González, Ian Desmond, and Bryce Harper. Strasburg ended the season 15–6 with a 3.16 ERA, 1.15 WHIP and 197 strikeouts in 159? innings pitched. He was selected to play in the 2012 MLB All-Star Game. Strasburg still pitches an average fastball of 94.7 mph.1 For Strasburg's career stats, click here. 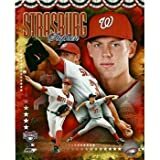 Featured here are Stephen Strasburg posters, photos, giant collectibles and apparel.